A predetermined amount of liquid (called operating fluid) is pumped through a header to one or more tank eductors submerged inside the tank. Depending upon the application , the operating fluid can be liquid drawn from the tank, or it can be a second liquid from another source that is to be mixed with the tank contents. 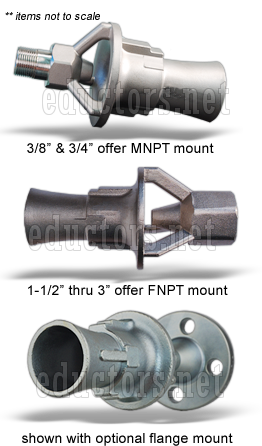 As the operating fluid leaves the nozzle of the tank eductor, it entrains material from the tank. The operating fluid and entrained material are thoroughly mixed inside the parallel section of the tank eductor before being discharged . The discharge flow, or plume, continues the mixing and agitation of the liquid throughout the tank. The rate at which fluid in the tank must be completely turned over will determine the overall capacity of the tank eductors needed. When the inlet pressure supplied to the tank eductor is within a range of 20 to 70 PSI (133 to 483 kPa) , 3-5 gallons of tank contents can be mixed for every gallon of operating fluid passing through the tank eductor . That is, the volume of fluid discharged from the tank eductor will be four times greater than the volume of operating fluid entering the circulating tank eductor inlet. The ratio of tank contents that can be mixed for each gallon of operating fluid will be approximately 2.6:1 for pressures outside the 20 to 70 PSI (1 38 t o 483 kPa) range, listed in the capacity chart. 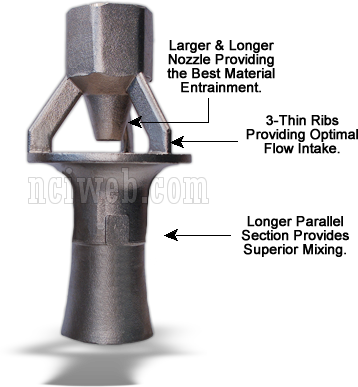 Fluid viscosity In fluids such as water or mineral oil (Newtonian fluids), the length of the tank eductor discharge plume increases proportionally with increased operating fluid pressure . Flow will b e evident one foot away from the tank eductor discharge for every 1 PSI of pressure drop across the nozzle (or one meter away for every 23 kPa pressure drop). An approximation of the discharge plume length can be obtained by substituting operating fluid pressure for 6. P in the above relationships. In some fluids (dilatent), the length of the discharge plume decreases as the operating fluid pressure is increased. In still other fluids ( thixotropic), very little flow will be evident at the circulating tank eductor discharge until the operating fluid pressure is increased beyond a critical value, after which lo increases rapidly. If necessary, contact us when dealing with such fluids. 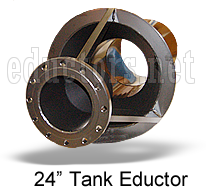 Tank shape and size influence the placement and number of circulating tank eductors required to assure even agitation of the entire volume of fluid. A spherical tank with a single circulating tank eductor mounted as shown in the illustration makes the best use of the mixing and flow characteristics of the circulating tank eductor. With no corners to impede fluid flow, the fluid circulates evenly and naturally. A single circulating tank eductor will often be sufficient to circulate the entire tank contents. The angular intersection of surfaces in cylindrical , square or rectangular tanks can interrupt fluid flow patterns and cause fluid stagnation in these areas. A single circulating tank eductor, mounted as shown in the illustration, will tend to minimize this effect . 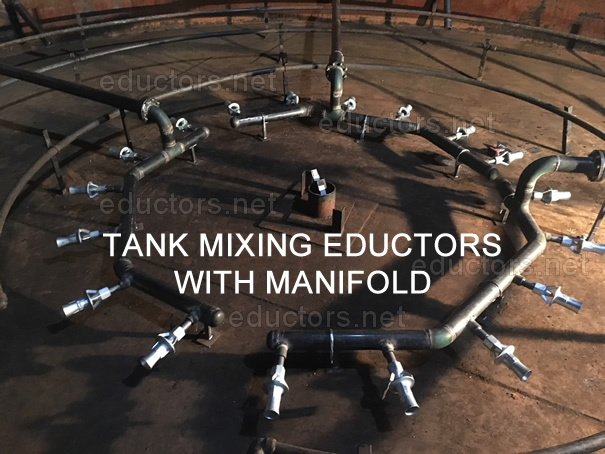 However, multiple circulating tank eductors can often produce more efficient mixing when using these tank shapes.